Researchers at University College London, Karl Woodbridge and Kevin Chetty, designed a detector that uses Wifi radio signals to detect people through walls. Much like the concept of a radar that reflects radio waves off of radio towers. There are Wifi radio signals found in 61% of homes in the US, and in 25% of homes worldwide. Woodbridge and Chetty’s radar prototype identifies frequency changes to detect moving objects and when a radio wave reflects off a moving object, its frequency changes. That is The Doppler Effect. 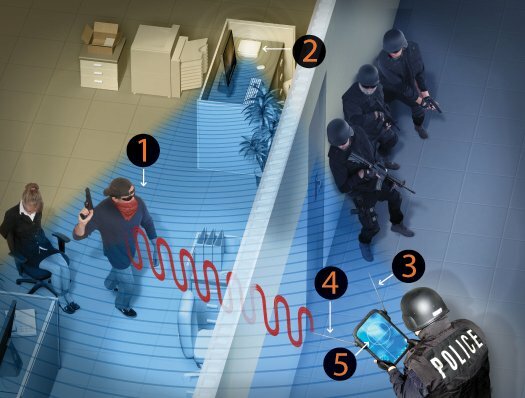 The detection device is composed of two antennas and a signal processing unit, and in tests has been able to determine a persons’ location, direction and speed. This was possible even through a one-foot thick brick wall. Woodbridge says, with improvements the device could become sensitive enough to pick up on subtle motions the ribcage makes during breathing. This would allow the radar to detect people who are standing or sitting still. The U.K. Ministry of Defence has funded a study to determine whether it could be used to scan buildings during hostile situations and urban warfare. Neal Patwari’s wireless engineering group at the University of Utah designed a network of 20 inexpensive radio transmitters that are placed around a patient’s bed. Then they created an algorithm that detects a stationary person’s breaths better than current detectors do. Patwari plans to upgrade the algorithm by the end of the year to filter out body movements too. The system could someday be used in hospitals in place of tubes and masks.